As you know Android is the most widely used and customizable mobile OS. its price makes it most popular Smartphone OS. If you’ve just bought a new Android Smartphone,then here are some very useful tips and tricks you should know to use your lovable new device.Most of these tips and tricks are meant for new users,but I’m quite sure that even long time Android os users have either forgotten or aren’t using few of them actively.The reason for compiling these tips and tricks is to get you to incorporate them in your daily work flow so that you use your device more efficiently (and spend less time using them).If you need help with any particular tip,I’ve included links and screenshots wherever available to our step-by-step guides which will provide more details. So Here are some of the top tricks and tips for getting most from your android smartphone. First thing first , you’ll need to enable access to the hidden “Developer options” menu on your Android phone. To do that, simply tap the “About phone” option in Settings. Then tap “Build number” four to seven times and you’re done. Now just back out to the main Settings menu and you’ll find Developer options just above the “About phone” option in Settings. Hate the fact that when you are typing and text which is not a correct word (not in dictionary) or you are using short form of words and the word you typed is changed automatically ? then this will definitely help you so just Turn off auto-correction.and enjoy typing,chatting and texting in your own style….. Tap on the settings icon next to the keyboard that you are using, e.g. Android Keyboard. Find Auto-correction and tap on it. if you have some very private files in your phone and you want to hide them from others. then this trick will definitly help you. Method 1) Install Root explorer or any other free 3rd party file manager and Create a new file with name “.nomedia” (only “.nomedia ” nothing before and nothing after it)and paste it in desired folder where all required files are exist and restart your device.it will hide all media from gallery or media apps not from file manager. How to Unhide:-Just delete .nomedia file and restart your smartphone. Method 2) Add a “dot” (.) before the name of the folder. for example if you have private media in the folder “Picture” then just simply rename it to “.Picture” .No reboot and 3rd party app required..with the help of this trick you can hide all media from everywhere even from file manager. How to Unhide:- Go to File manager app>options>and tap on show hidden files.and remove dot from the folder name>restart. card in Pictures>Screenshot folder . option is only available on Jelly Bean 4.1 and above . 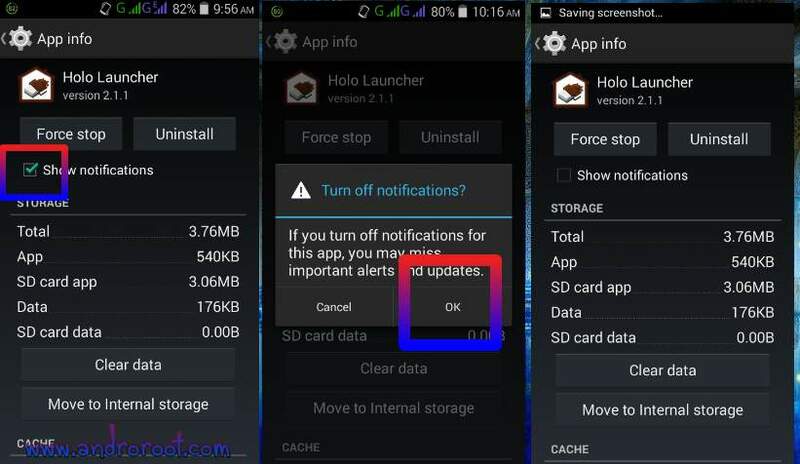 Method 1)Go to Settings>Apps>All>your desired app>Untick Show Notifications >OK. faster and smoother as a result. 2.Swipe right and look for the All tab. 3.Select the app you want to remove as default. If you want to enable the auto updates,then just follow the same path and choose Auto-update apps at any time or via Wi-Fi. 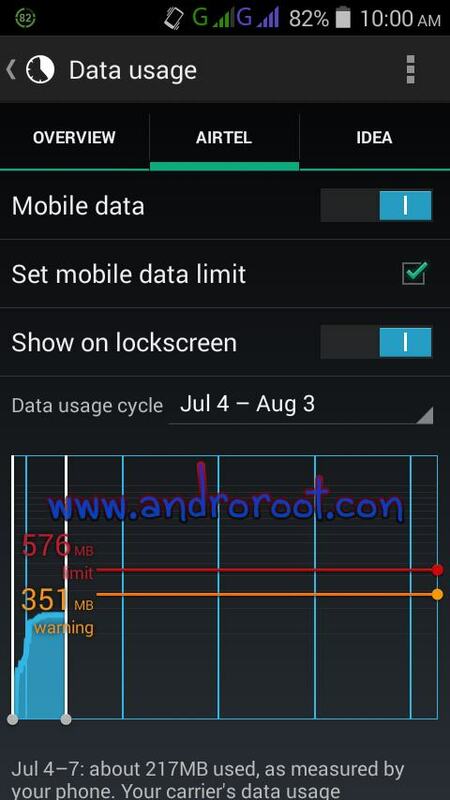 If you have ICS and above, there is a feature by which you can set mobile limit data or just keep track of how much of the quota you have left. Go to Settings> Data Usage. Set your data usage cycle based on when your “month” starts and ends. The data will be automatically disabled when you reaches the fixed data limit. variables, but it is still going to save you something worth saving. Many people don’t know that the wallpaper color(+Brightness & darkness) you choose can make a difference on the battery life of your Smartphone. So select a Pure Black or a dark colored Background as a wallpaper.and enable the Power saving mode, turn off auto-brightness and see how great the battery savings are.